It might boast a bit of a bizarre name, but the new Citroen Cactus has a few tricks up its sleeve to poke the opposition. Nothing really looks quite as similar – except, perhaps, a Toyota FJ Cruiser or Nissan Juke for their similarly way-out-there design. Citroen is no stranger to being a little different; just think Citroen CV, Citroen XM, Citroen DS, and you’ll get the idea. The Citroen Cactus adds a bit more to the different way that it looks; and that’s in the way it can happily toddle down the road in exceptional comfort and amazing fuel efficiency. Rounded edges, massive wheel arches, low roof-line and squinty headlights add up to a look that is actually pretty cool! Citroen’s new Cactus is powered by a zippy new 1.6-liter turbo-diesel engine that has the code name: E-HDi 92. The engine equips the new Citroen Cactus with a top speed of 182 km/h. Not that that really matters all that much, but it does say that cruising on the motorway is very good – not to mention quiet. And did you know the Citroen Cactus is capable of around 3.5 litres / 100 km. Yes, you read that right! I’d say Citroen will be starting to smirk quietly. Oh yes, the diesel engine emits just 90g/km of CO2. There is also an 81 kW PureTech turbo petrol with Stop and Start technology and a 5-speed manual available. This engine develops a maximum power of 81 kW at 5500 rpm with torque of 205 Nm at 1500 rpm. A combined consumption of just 4.7 litres/100 km and 107g/km of CO2 emissions is also pretty exciting potential. The PureTech turbo petrol engine has won the 2015 International Engine of the Year award in its category (1.0 – 1.4 litre). I’d say by this stage that Citroen’s smirk is getting a little more extrovert by now! Another difference that adds to the Cactus’s quirkiness is the hinged, rather than electric, rear windows. I actually reckon they work really well, and it was part of Citroen’s clever weight loss regime. The new Citroen Cactus is 200 kg lighter than the Citroen C4 hatchback. When seated inside the roomy Cactus interior, the leg room and bum space is very good. The seats are very good over the long haul, the entire chassis and seat systems keeping the occupants well remote from the rough roads which are passing beneath. You really need to drive one to get the idea of the successful high ride quality you are going to get for a fraction of the price of a high-end Audi or BMW. Offering a high position on the road, the driver gets a great view of the road ahead. The car’s steering is easy and light around town making it a breeze to drive in congested traffic. The higher seating position also means that the Citroen Cactus also provides a very good boot with excellent luggage carrying capacity. There are plenty of useful storage compartments around the cabin. In the centre of the stylish dash is a seven-inch touchscreen that’s easy to use and easy to read. DAB digital radio, Jukebox 8GB music storage and six-speaker surround sound are standard items. Front electric windows make the flow of air easy to access. The Citroen Cactus looks to be very good value with alloy wheels, air-conditioning, Bluetooth phone connection front armrests. Steering wheel mounted controls, electric power steering, automatic air conditioning, automatic windscreen wipers with an auto wash function, a reversing camera with rear parking sensors all standard features. eMyWay Satellite Navigation and leather interiors are options. The Bi-Tone leather steering wheel with chrome inserts looks and feels great. Yes, there is plenty of plastic used in the front dash to keep the costs low, but the overall design of the dash looks attractive and eye-catching. Easy to use gear selector paddles and an aircraft–style manual handbrake keep the cabin and driving experience interesting and enjoyable. You might notice in the picture that there is this bumpy looking add-on to the door panelling. 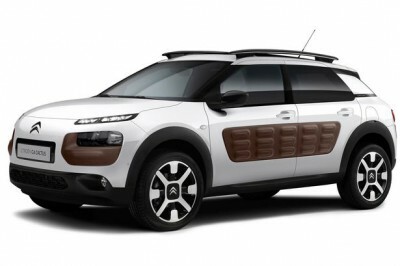 Citroen has fitted the doors of the Cactus with rubber panels called ‘Airbumps’. These large, textured and replaceable panels aim to prevent knocks and dings to the paintwork. You can choose your airbumps from four colours. Black longitudinal roof bars, gloss black wing mirrors, an optional glass panoramic roof with high thermal protection, body colour painted door handles, dark tinted rear windows and Zephyr alloys do create a very nice visual impact. Citroen has fitted the Cactus with height adjustable halogen headlights, LED Daytime Running Lights (DRLs), front fog lights with cornering function, automatic headlights and a ‘Guide-me-home’ headlamp function. Citroen always features highly in the crash testing results, and it’s things like the ABS with Electronic Brakeforce Distribution (EBFD) and Emergency Braking Assistance (EBA), Electronic Stability Control (ESC), Hill start assist, programmable cruise control with speed limiter, a tyre pressure monitor, a full array of airbags, two rear ISOFIX mounting points, electronic child locking, remote control central locking with deadlocks and an alarm are reasons why the Citroen marque keeps at the forefront of safety. 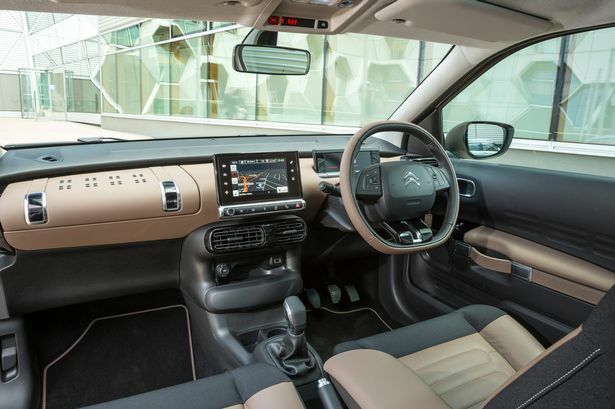 The standout for me is the way the Citroen Cactus looks different, rides superbly comfortably, is amazingly fuel efficient and provides top seating for five adults in style and comfort. This is Citroen’s new winner. For any more information on the Citroen Cactus or, for that matter, any other new car, contact one of our friendly consultants on 1300 303 181. If you’d like some fleet discount pricing (yes even for private buyers! ), we can submit vehicle quote requests out to our national network of Citroen dealers and come back with pricing within 24 hours. Private Fleet – car buying made easy!